Rice Krispie Treat Recipe with Flax!~ Delicious Rice Crispy Squares Recipe~! Rice Krispie Treat Recipe with Flax! Rice Krispie Treat Recipe use Gourmet Flax seed to make Remarkably Yummy + OF Course~ Easy + Healthy Rice Krispies Bars! You will LOVE them! MMmmm! I am SO excited to offer you another Yummy recipe with Gourmet Flaxseed! And, when I splurge on something sweet, one of my favs is Rice Krispies Bars! :) What is SO GREAT about adding flax to your Rice Crispy Squares Recipe is that it adds essential nutrients including Omega 3 as well as helping to fill you up more than a regular Rice Crispy Square would! Remember, you get the good fiber, protein, Omega 3 and lignans ~ all of these help your body to feel happy while getting a sweet treat! So, I hope you enjoy the Rice Krispie Treat Recipe as much as I and my family have! In a large bowl, add rice krispys and flax -no need to mix. On Stove top: Melt the butter and marshmallows together in a saucepan over low-medium heat -stirring frequently. Add vanilla. In Microwave: Melt butter in microwaveable bowl for 50 secs or until melted. Add marshmallows and stir -Microwave again for 1-1/2 Mins (stirring occasionally) or until marshmallows melted. Add vanilla. Add the marshmallow mixture to the rice crispys and stir until all rice crispys and flax are coated. Then place in a 9x13" pan and use a large piece of saran wrap to cover and then press rice krispy bars into pan. 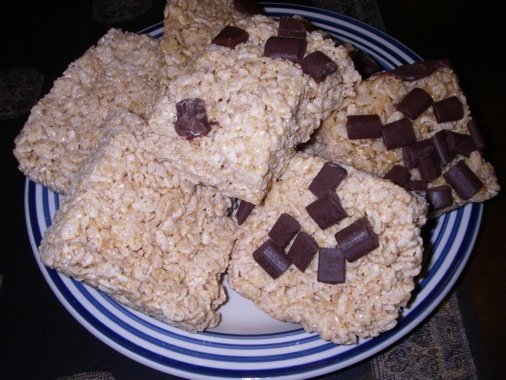 Sprinkle chocolate chips or your favorite candy on top of rice cripys and use saran wrap to press into rice crispy bars. You can then cut rice krispy bars into the desired size and wrap them in saran wrap for easy storage for later! Click here for the Gourmet Flax seed to make the Rice Krispie Treat Recipe!